Too busy! Much too busy! Also, have you ever been in a state of constant low-grade guilt because there are so many things you haven't yet gotten done? 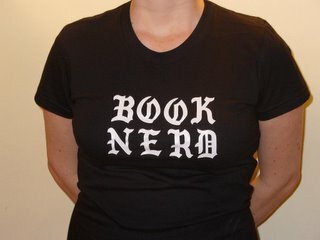 It's like that around here in Book Nerd land. Sometimes I think I'm just not cut out to be a blogger -- how do all you folks do it? But things are starting to get sorted out. The ELNO, for one, is well under way -- don't forget to email me if you're a New York-area young person in the book industry and you'd like to attend (or if you're a publisher who would like to donate some swag -- er, publicity materials -- for the event). I will get back to those of you who are interested in guest blogging as soon as I have time to think about a schedule -- don't think I don't appreciate your offers, because I DO! Hold that thought, and I'll be in touch soon. Hope you're having a good Wednesday -- see you in a state of sanity!